Gone are the days when people believed electric scooters (or electric kick scooters) are vehicles dedicated for those with mobility issues only. Today, it’s no longer like that; everyone, expect toddlers, rides an e-scooter. It’s fun to ride, and you’ll save a small fortune by owning one because you don’t have to spend on gas like you would if you were fuelling a car or motorbike. Also, this means you would not spend on bus passes or ever rent a car unless you have to. An electric scooter can go anywhere, assuming the distance is not longer than 20 miles. You can evade the nasty traffic on the road if you ride to work or school. If you want to go to the mall, bank or library, an electric scooter can get you there. Even if you have to board a bus or train in between your commutes, you can ride a scooter to get to the terminals. An electric scooter is fast although its speed can’t match that of, let say a Toyota car or the Kawasaki bike, it’s fast enough to get you to your destination. That’s not all; electric scooters are portable. Depending on the design, you can fold yours into a compact size, and carry it with your arms or pull it like a suitcase when you are not on the road. Another advantage of e-scooters is that they are eco-friendly because they do not run on gasoline. In this comprehensive guide, I’ll review some of the best electric scooters in the industry. Keep following. Who are Electric Scooters for? Always wear helmet and elbow pads, even you’re an adult. Nothing beats safety. You can ride an electric scooter anywhere, whether it’s going on a road trip, the library, bank, or shopping mall, you would just hop on your scooter and ride there. You would get there quick, without breaking a sweat, and your commute would be pleasantly entertaining. You just have to remember one thing before you leave home – to charge the scooter’s battery to full charge. Electric scooters are for anyone looking for anyone looking for transport that’s convenient, fun and cheap. Kids, teenagers, and even adults can experience the thrill of riding a scooter. Some electric scooters are specially designed adults, with some having a seat to enhance comfort. For the average grown up, they can ride the scooter when going to work, school, library, bank, shopping mall or ride around the neighborhood. If you live nearby a beach, or you plan to travel to the coast, you could ride a scooter to get to where you want. An elderly person or someone who is handicapped can use the scooter to move to where they want. I remember when my old man got a scooter; he loved it so much, he would ride it when getting his mail, or when he wanted to take animals out for a walk. Although he does not ride it as much these days, back then you would catch him riding in the park most of the weekends, with the dogs chasing behind him. Also, kids can ride electric scooters. Why should they miss the fun? They can use it to buzz around the neighborhood, and the only time you would see them is probably when the battery drains. Mostly, electric scooters for kids do not have a seat; rather the scooter just has a standing deck that supports the weight of the kid when riding. Some models in the market can accommodate two kids. The E300 is a powerful beast that makes scooting entertaining for the rider who can handle it. Of all the scooters from Razor, the E300 is probably the largest. Being a full-featured machine, any teenager or adult can take the E300 for a spin. With this scooter, you can explore the land of our beautiful country. It can cruise anywhere, even in places where the roads are made of dirt. When you look at the E300, you can tell it’s well-engineered. Its frame is constructed of steel, which explains why it’s heavy since it weighs 53 pounds. While its weight makes it stable, it’s hard to carry it around, especially because it does not fold. Make sure your garage has ample space to store it. Because it has a spacious deck and frame, both adults and teens can ride on this scooter. Even someone who is 6’3” can comfortably ride this scooter. The maximum weight it can support is 220 pounds. If you judge it by its size, it’s hard to believe the E300 can go past 12 mph. A high-torque, chain driven motor, combined with a twist grip accelerator makes it possible to clock up to a speed of 15 mph, assuming you aren’t that heavy and you weigh around 200 pounds. When a heavier person is on board, the speed can reach between 10 mph and 12 mph. Unlike some scooters that you have to push to start the engine, the E300 uses a twist-grip accelerator. When you want to start the scooter’s engine, all you have to do is simply twist the throttle, which is more like an on/off power switch; hence, you cannot vary the scooter’s acceleration. Because the E300 has big inflatable pneumatic wheels, it can smoothly ride on bumpy roads and trails. Word out there is that newer models have smaller tires compared to electric scooters from back then. However, to be honest, the tires are just the perfect size for a scooter, considering the scooter can ride on off-roads. You don’t have to worry when riding at top speed its brakes are efficient and secure. Twisting the brakes handle will effortlessly bring the scooter to an immediate stop. 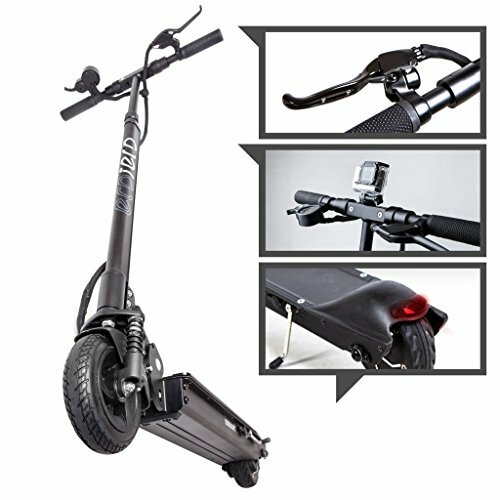 Its retractable kickstand enables the scooter to stand still when not on the move. It’a 24V rechargeable battery system gives you a range of up to 15 when fully charged. Razor has advertised the total run time as 40 minutes, but you get like an hour of pure fun. They should find a way to reduce the time it takes to recharge its battery. On the positive, you can coast with this scooter and save battery. Just remember two things if you want to prolong its battery life: one, power the scooter off if not riding, and two; do not let the battery drain. The E300 shines when moving on flat ground, but that does not mean it cannot ride on rough trails. My only disappointment is that it did does not have much stamina to climb steep hills although it has no problem going up less steep hills. Given its affordable price, its speed and range are reasonable, considering it has a built like that of a tank. When you ride the Glion electric scooter, you will get to experience the real joy of scooting. It’s not super fast, but it is also not slow. Compared to most electric scooters, it’s cheaper by several hundred dollars. It’s small and sturdy enough to accommodate a person weighing up to 255 pounds (115kgs). A 250 Watt DC hub motor powers the scooter while 8-inches honeycomb tires that are ever inflated ensure the ride is smooth. Its motor may not seem that powerful, but it propels the scooter up to a speed of 15 mph, which is equivalent of 25kmh. When it comes to moving up inclined planes, the Glion can climb up small hills, probably 30 degrees slope. The scooter picks up speed when you engage its accelerator, and the speed does not reduce unless you press the brakes. Although the brakes are secure and they work fine, I noticed that when you engage the brakes, you have to rotate the handle to about 30 degrees. On the other hand, the accelerator gradually engages when rotated at about 10-15 degrees. The Glion is relatively lightweight since it weighs only 28 pounds, but that’s because its frame is built with lightweight aircraft grade components. Still, it’s well-balanced, and it’s easy to maneuver around with it. Now, when I say, the Glion is the best folding electric scooter, believe me, it is. I loved that I could quickly fold it into a dolly-like suitcase, allowing me to wheel it behind me like a suitcase when I’m not riding it. Also, when folded, it can stand in an upright position, which is a big plus when you’re traveling or when you need to store it in the luggage rack, car’s trunk or garage. When you are not riding the scoot, just place it in a vertical position, whether it’s in your closet, at the train, or at the corner of a room. As for the battery, the Glion is powered by a 36V 6.6 ah Lithium Ion battery that gives you a range of up to 15 miles when riding on level ground, with one full charge. Its battery can last 1000+ cycles and it only takes about 3.5 hours to recharge it. However, always ensure the scooter’s battery has power because the brakes don’t function without power. I feel they should have made the brake mechanical, just for peace of mind. I loved the fact that it has a bell, headlight, and a rear reflector. Also, mounted on its handlebar’s is a battery indicator that makes it easy to track the battery life. Although some scooters on the market are more powerful and comfortable, what makes this particular scooter stand out is the fact that it’s smaller, affordable, and portable. Now, S3 is the best electric scooter for adults. It picks up so much momentum, any grown up who will get to ride it will have a wonderful time. No doubt, when riding the M5, you will want to have a helmet on because this scooter is fast, way fast than most scooters out there. Now this is my opinion, but this scooter would be the best electric scooter if it’s more affordable. With the S3 machine, you can weave through traffic or ride on the rough trails in the countryside. Don’t be surprised if you get to pass cyclists and slow moving vehicles. Riding this scooter is just as fast as peddling a Mountain bike, only that you won’t get tired. The S3 uses a dual (front and rear) suspension to deliver a smooth and comfortable ride. Also, it truly has a fine speed and agility thanks to a twist-grip throttle gear that you can vary and a 400W brushless motor. You can attain up to 20 mph, but that’s after you’ve plucked out the speed governor, which limits its initial speed to about 14 mph when the scooter is still brand new. On level ground, you can hit 20 MPH, and if it’s a sloping lane, you can reap 25 MPH. While it’s fast when traveling on a flat or an inclined road, going up a steep hill can be a challenge – you may need to give it an extra push. Sometimes, it feels dangerous when riding this scooter at top speed, but that should never make you feel paranoid because its brakes work well. The brakes are mechanically powerful, and they bring the scooter to an immediate halt once engaged. The S3 is a tough machine; you will love its sturdy frame construction which is built with heavy duty aircraft aluminum. Hence, the vehicle is rigid and stable, such that when you get on board, you feel totally in control. When I first got a chance to take it to the road, I felt like I was riding a new sports car. Because it’s designed with lightweight material, it weighs 47 pounds, of which we can’t say is heavy but should you decide to carry it for long, you may feel the weight. Otherwise, if you occasionally hit the gym, you probably won’t feel it. Also, you can easily fold this scooter, place it underneath your arm, and then walk into a coffee shop or restaurant without people noticing you have a scooter. I imagine if it was a bike, you would have to leave it outside. When you fold this scooter, many people won’t even notice it unless they are keen enough to tell what it is because it looks like a piece of equipment. When its battery is fully charged, you can put it in at least 8 to 10 miles with the S3. If you wish to ride more than 10 miles, make sure you carry your charger. The battery takes a few hours to recharge. You just need about 4 hours 30 minutes for the battery to recharge to full capacity. It has an indicator that shows the amount of charge left and a speedometer that shows how fast you are going. Any adult can ride this scooter since it can carry a maximum weight of 400 pounds. So, if you weigh around 280 pounds, it will effortlessly haul you around. It doesn’t matter whether you are 50 years old or 6”-inches tall, you will enjoy riding this scooter. The S3 can take you almost everywhere you want. You can ride on sidewalks, streets, metal grates, dry earth roads, and even in uphill areas. It’s a shame this scooter can’t climb steep hills, given its high price but still, it makes up for that by being fast and having solid construction and safety features. When I did some errands with the V1000, I sure had a blast. The ride was smooth even when I was cruising on bumpy and rough roads. It’s a little beast that’s not only comfortable to ride but also amazingly fast. It uses a brushless hub motor with a power potential of 500 watts. This motor, combined with a complete dual suspension, plus signature 200mm ever-inflated tires, the V1000 comfortably whizzes along the bumpy and rough terrain. Start the scooter by simply pressing a button to reap speeds of up to 20 mph; you can even go up hills. Someone who is 6’1” tall and weighs around 210 pounds can ride on this scooter up a sloping road without much difficulty. The V1000 has an efficient braking system. So when you are moving at 20 mph, and you need to stop, its rear brake system will enable you to stop safely and immediately. Apart from that, the V1000 is sleek and stylish. 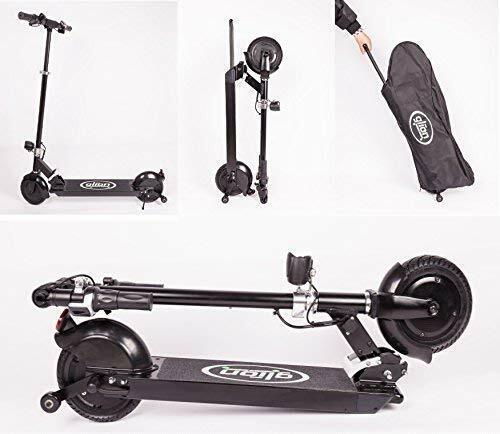 If you give this machine a quick look, you’ll know right away that’s it’s built to last; the scooter is constructed with durable Aircraft Grade Aluminum alloy. It’s sturdy, and comfortable to ride so long as you don’t exceed the maximum weight capacity, which is 220 pounds. Considering it weighs only 35 pounds when folded, it becomes compact, such that when you lift it off the ground or when you carry it over a short distance, it won’t leave your arms tired. So, when you are riding on the train or bus, you can easily tuck it beneath the seat, and if you have a car, it will nicely fit in the trunk. When you charge its battery to full capacity, the charge can last between 10 and 15 miles when going at a speed of about 20 mph. Typically, its battery lasts about an hour of continuous use, which is a lot of time, given its fast speed. It has an ergonomic suspension. One charge lasts 15 miles. The black Super Turbo gives you the thrill of riding on a scooter that runs on a true-1000 watt motor. While some may think of the Black Super toy, I’d be happy to tell you that it’s not. Otherwise, I believe wouldn’t you call a machine with a Super Turbo 1,000 Watt motor, moving at a speed of 25 mph a toy. While it has a beautiful design and a strongly built frame, it’s a heavy scooter that weighs exactly 75 pounds. Still, it can easily fold, which is an advantage when you finish your ride and you need to tuck it somewhere. Despite being a heavy vehicle, it’s tough when on the road. It has a pretty impressive performance thanks to a fast 1000W motor, an efficient throttle with an Econo/Turbo button to vary the distance and speed, front and rear shock absorbers for absorbing vibrations, and strong tires that can sustain the roughest of roads. Riding this scooter is so much fun and comfortable, the feeling is like that of riding on a motorbike because of the comfy saddle seat that’s also removable. It can grind on most flat roads and even make its way up places where the hills aren’t steep. Its brakes work well, and they do not need much force to engage them. Who specifically can ride this scooter? Both adults and kids can take this for a spin. It supports a maximum weight of between 250 and 300 pounds. Despite being 6’1” tall and weighing 210 pounds, I was able to travel to any place I pleased. You can get your son, daughter, or folks this scooter as a gift. I believe even an 80-year-old grandpa can ride this e-scooter. Just make sure you wear a motocross helmet when going for a ride because this thing is damn fast. When you recharge its 36v 12 ah battery, you can ride several miles every day. Its batteries do not run out of power fast, and you can put in probably 10 miles per day. Still, you may need to replace the battery after several months of use, say six months or so. Super Cycles ought to have made a longer lasting battery, given that this scooter is over $500. Another feature I’m sure you will love is the LED headlight, which comes in handy should the night find you on the road. Also, it has a battery indicator that shows the amount of charge left as you drive. The indicator emits a green light when it’s full charge or red when the battery is low. Please know that there is an imitation of this scooter from Super Cycles on the market. The low-priced product looks just like this beast, but from what I hear, it does not live up to expectations. So, in case you pick this machine, make sure it’s from Super Cycles. It has dual shock absorbers. Its parts are readily available. Both adults and kids can ride. It has a headlight and a battery indicator. Its battery wears out after several months. It has no LCD display or speedometer. Although it’s an expensive scooter, its speed and agility are commendable. The Razor E200 features a beautiful cyan color with a full-size deck that can support two kids. A 12-years old kid can hope on this scooter and buzz around the hood; it’s fun to ride, and it will keep them entertained during their young days. If your child is riding an electric scooter for the first time, other kids and teens around the block will also want to ride one. Don’t be surprised to see other kids on the block with a scooter too. This scooter is not meant for just kids; teens and adults can feel the joy of scooting with it. Even elderly people can roll with this one around the neighborhood while enjoying the scenic beauty of nature. Also, if you are riding a scooter for the first time, this one right here is a good one for practice. It boasts a high-torque, chain driven motor that’s ultra quiet, and a handy twist grip accelerator. With these specs, it can reap speeds of up 12 mph. Of course, the speed is not that super-fast, but if you think about it, it’s a scooter recommended for kids; the speed is favorable. That’s not all; it has a spacious deck and frame that can support at most two kids, 8-inch pneumatic tires that can withstand harsh weather and rough roads, and an efficient rear brake system that effortlessly engages when you want immediate stopping. Also, the E200 is equipped with a spring loaded kickstand for putting the vehicle in an upright position when you want to park it. It’s clear the engineers who assembled this machine did put some thought into its design. With the specs the E200 boasts of, this scooter doesn’t disappoint when on the road. Because its frame is constructed with steel and not aluminum, it’s lightweight since it weighs about 39 pounds. With its spacious deck, the E200 can support a maximum weight of 154 pounds. That means two kids can comfortably ride on this scooter. However, don’t bet on it when it comes to going up a steep hill but it can do well on slightly steep slopes and bumps. A rechargeable 24V seal battery gives the E200 enough power to keep it going continuously for about 40 minutes, at most an hour. Once charged, you can ride up to 5 miles a day before the battery drains out. My only issue with the battery is that you will need to replace it after using it for several months. It uses a powerful motor. It has a twist-grip throttle gear. Its speed is perfect for kids. Two kids can ride on this. The tires are not suited for off-road rides. Its battery needs to be replaced since it wears out after a few months. It has no headlight or LED display. It has no speedometer or a battery indicator. The E200 fits the bill for as the best electric scooters for kids. It would have been nice if Razor made this scooter foldable, and fit it with accessories like a LED display, speedometer and a headlight. Still, given its price, which is a little over a $100, this scooter is worth the range and speed it offers. The RX200 has a unique and classy design. Some of its outstanding features include soft rubber grips, riser style handlebars, an advanced gear ratio, heavy duty tires and a retractable kickstand. 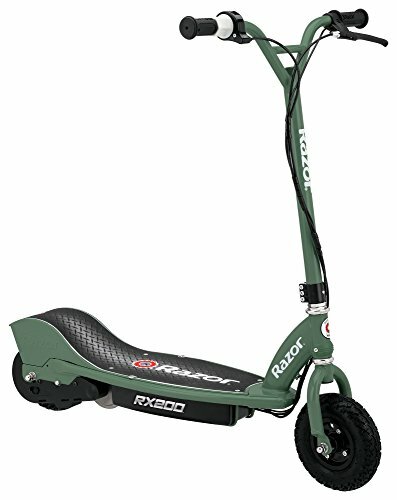 If you are thinking of getting your son or daughter a scooter as a gift, the RX200 is also a perfect gift. Your kids will love it so much, especially because they can take it off-roads. They will probably ride it every day, and the only time you would see them is when the scooter’s battery drains. With the RX200 electric scooter, the real fun begins when you reach the end of the pavement. It does its thing better when moving on rough roads but it can also ride on pavements and tarmac roads. It uses a high-torque, chain driven motor and a twist-grip accelerator just like the E200. It hauls enough power to move through rough trail and climb small inclinations at maximum speed of12 mph, the equivalent of 19kph. Considering the scooter is recommended for kids, the speed is acceptable. Although its frame is constructed with steel, it is slightly heavier than the E200; the RX200 weighs 46 pounds. Also, it has a spacious deck that can support a maximum weight of 154 pounds. Thus, two kids or a full grown up can comfortably ride it. The main thing that makes the RX200 stand out is the size and profile of the tires. The scooter uses strong tires that have a pressure of 60 PSI. With these wheels, it has a spectacular performance when cruising off-roads, where there are tough terrain and bumps. In case you are riding and you want to drift or stop, all you have to do is hit the brakes, and the scooter will come to an immediate stop. On top of that, it has a rear sprocket chain with a freewheel that makes it possible to coast with this scooter and save some charge. It uses lead acid battery system, which has a capacity of 24V and gives you about 40 minutes of non-stop use. When it comes to recharging its battery, it takes a whopping 10-12 hours for the battery to get to full capacity, which is a long time to wait unless you are a patient person. Make sure you charge it overnight so that so that when the morning comes, it will be ready to hit the road. It would have been great if this scooter was capable of folding since carrying it around can be tiresome. Also, features like a battery indicator, headlight, and speedometer would have been a plus. Its tires are built for off-roads. Two kids can comfortably ride it. Its battery takes longs to recharge. It has no speedometer or LED display. The RX200 is a wise pick you need a reasonably priced scooter that will be tough on the road even when the weather is harsh. Last on our list is UberScoot, the best electric scooter with a seat. Despite being a small electric scooter, grownups will have a great time when they take it for a spin. Your folks, uncles, aunts, grandpa, and grandma can experience the joy of riding an electric scooter. There is no doubt they will love it. This small, black machine runs on a chain-driven 1,600watt motor, and it’s fitted with a twist-grip accelerator gear system to deliver a brilliant performance. With the level of power the scooter hauls, a grown up is better off handling the Uberscoot. This scooter can carry someone weighing 265 while traveling at a top speed of 26 mph on flat ground. You will need to wear a helmet when riding at that speed. You can ride Uberscoot anywhere you wish because it uses 10-inch pneumatic tires and a new gear system. You could go joy riding around your mansion, neighborhood, on the streets or at the country side. Old folks would enjoy riding this scooter because it has a comfortable saddle seat. The UberScoot frame is made of steel, and its deck is strong enough to carry someone weighing not more than 300 pounds. As for how heavy it is; it’s reasonably heavy since it weighs approximately 79 pounds. Even though you can fold it, you would still feel the weight if you were to carry it over a long distance. At least, when you fold it, it becomes compact, such that you can fit it under the seat of the train or bus. My only wish, more importantly, would be to have a battery that lasts longer. Its 36V rechargeable battery is not designed to go for extended ranges. One full charge lasts about 12 miles, which is half of what top-rated electric scooters can attain. So, if you want a scooter that can put in more miles, consider models like the Glion, the M5 or the Razor E300. Finally, the scooter has a battery indicator that signals the battery level and economy mode button for conserving the battery life. When you tap on the control button, the scooter decelerates, thereby saving power. It has a powerful motor, 1,600watts. It has both front and rear brakes. It has an LED battery indicator. It has no headlight or speedometer. It’s not a cheap scooter, but its performance on the road and rigid frame make the price worth it. My only issue is the battery, which lasts half the range of the most electric scooters. If you are thinking of buying an electric scooter, it’s best you weigh the pros and cons of the different models out there. Below are some several factors to meditate when choosing the perfect electric scooter. The frame is the core structure of a scooter since it supports the motor, front fork, battery pack, wheels and the deck for standing. Do not settle for a scooter with a flimsy or poorly constructed frame. It will only be a matter of time before it breaks down, which can be so disappointing. Go for a robust scooter that’s built with durable components, such as steel or aluminum. Frames made with aircraft aluminum alloy tend to be lighter compared to those made of steel. The design you pick will ultimately depend on your taste and what you like. You may want a scooter with a seat to feel more comfortable while somebody else may want a scooter with just a solid deck without the seat. Often, electric scooters with a seat are built for adults while those with just a deck are designed for kids. The motor is a critical component of the scooter; if it were not for the motor, you would have to push to ride it, and you would only ride on a flat or sloping ground. The motor is of the factors that determine your scooter’s speed. A scooter running on a motor with a higher watts rating will have more power and torque. This means a 250W motor provides less power compared to a 1,000W motor. A scooter with a high watts motor is ideal if you are looking for something that you can take off-road, climb hills or move through rough terrain. Kid’s electric scooters usually have a 120W motor – the speed can get to 12 mph at most. As for adult scooters, they motors can have a power up to 1000W, and a top speed of about 30 mph. Modern electric scooters mostly use hub motors or brushless DC motors, which tend to be quiet even operating at low speeds. The other critical component of an electric scooter is the battery pack. If it were not for the battery and motor, you would still have to kick and push scooter it whenever you are the move. Depending on the make, most battery systems have a power that ranges between 12V and 50V, where one full charge can take you 10-20 miles. An electric scooter with a lasting battery pack will make your ride joyous because the battery won’t rapidly deplete. Electric scooters that use lithium-ion batteries seem to go for extended ranges compared to those that use heavy lead-acid batteries. Your safety on the road matters. That’s why you should see to it that your vehicle has a strong and efficient braking system. The scooter’s brakes should have a high stopping power, such that using a small force will effortlessly engage them and halt the scooter from moving any further. Some scooters have brakes on both wheels while those with a single brake are mostly fitted on the rear wheel. Most scooters on the market use disc brakes because they are known to have an enhanced stopping power. When looking at the wheels, pay particular attention to the hardness and wheel diameter. Scooter’s wheel comes in different sizes and hardness level, also known as the durometer. Big wheels are faster compared to small ones. Hard wheels are suited for riding off-roads or on the streets while soft wheels do well on the parks and pavements. Also, some electric scooters have wheels that are fitted with a suspension system for absorbing shock and vibration when you are on the road. A scooter with shock absorbers will have a smoother ride. Sure, electric scooters can’t go as fast as a motorcycle or like the Toyota Mark X, but the speed is favorable. Depending on the rider’s weight terrain, size of the wheels, the speed can range between 8 mph and 30 mph. You can pick a scooter that moves at 12 mph, especially if it’s for kids or you can opt for one that averages 25 mph. Some electric scooters come with a speedometer or an LCD display that shows the speed and range traveled. Others have a battery indicator that shows the battery life as you ride or a control button for varying the speed and range of the vehicle. Still, not many scooters on the market come with features like speedometer, control button, or an LCD. Still, you can always pimp your scooter with these accessories you want. When it comes to price, the trick is to find a balance between quality and price. From experience, cheap is expensive. A cheap scooter will probably last for a while before it breaks down because it’s built with subpar components. Even so, you can still find a superior scooter at an affordable price. Expect the toughest scooters to cost more, but they are also more durable and comfortable. The price can range between $125 and $350 for electric scooters for kids while electric scooters for adults can cost up to $900. Electric scooters for adults are of a higher standard; although they are expensive, fast, durable, and they use are made using advanced technology. On the flip side, scooters for kids less are expensive, but they aren’t as durable. Technologies are changing real fast. With the advancing technologies, we can expect the battery life of electric scooters, as well as any electric transportation, to be increased significantly. Also, we should expect IoT technology to be integrated into electric scooter. Honestly, I think the list for best electric scooter of 2020 will likely to change. We’ll keep an eye out to watch for any new exciting electric scooter, and review the product as soon as they hit the market. An electric scooter will surely not match the speed of a Subaru when put on the same race, but the speed is fast enough to move you around. Upgrading to an electric scooter will transform your life because it’s fun to ride. With an e-scooter, you will save a substantial amount of money, probably hundreds of dollars every month, money that you could have spent on gas. Also, by switching to an electric scooter, which is eco-friendly, you will be doing our planet Earth a huge favor, keeping in mind that the byproducts of fuel are the leading pollutants of our environment. Hopefully, with the information we have shared in this article, you know what to look for when shopping for an electric scooter, and that you won’t have any trouble making up your mind, now that you’ve come this far. If you do buy yourself or a loved one an e-scooter, don’t be surprised when you see people look at you with eyes that scream they secretly wish they had one. Happy scooting!